Unlike yeserday's mashup where I placed the negative on the scanner with a sheet of paper on top to then scan from the bottom as a document, in these I closed the scanner's lid and scanned the negative as a negative without having to reverse the image. And just for fun below is the previous negative (no accident, no double exposure but alas the Noblex's uncertain viewfinder had me crop out Rebecca's feet) showing that sometimes lucky accidents can produce interesting pictures while those meant not to be end up not quite right and even boring. Most of my life, as a photographer, I have asserted that I am a portrait photographer. I like to control my light and I don’t have the patience to wait for light. This does not mean that when I see a beautiful scene in nature that I don’t have an urge to snap whatever camera I might have handy. And I know enough about landscape photography to know some of the rules of composition and exposure. Most of all I know that the good landscape shot is rarely one of good luck. It is the result of knowledge, having good equipment and most of all having the patience to know when the light is just about perfect and if you wait one more minute it will be gone. 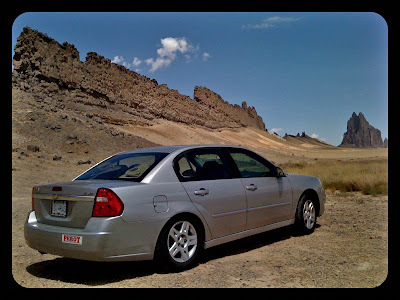 In our trip to south Texas, our Malibu took us to the Grand Canyon, Red Canyon, Great Salt Lake, the Painted Desert, Bryce Canyon, Petrified Forest, Shiprock Peack and many other landmarks of note. In most cases the light I found them under was the only light of choice as we were on a tight schedule and we could not linger much. The light at the Grand Canyon was muted in a late afternoon of undecided rain or shine. My photographs of the Grand Canyon are not spectacular except that the light was just about perfect for portraits. So the Grand Canyon served as a perfect backdrop for pictures of my granddaughters. There are three pictures here which I took with my Noblex Pro 175 U. This monstrously large camera made in Dresden (the digital age hastened its route to bankruptcy) is hard to load and is finicky in use. 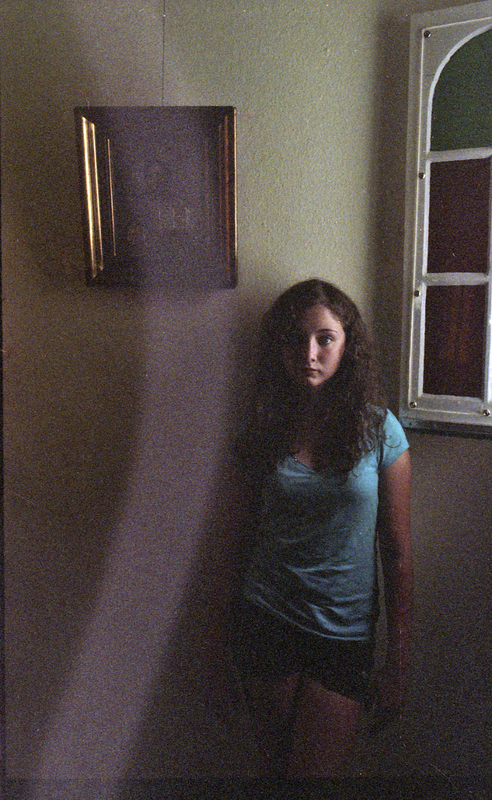 I have taken quite a few unintended double exposures. I have no yet despaired as some of them might be interesting, I was not shooting these panoramic (the lens swivels in a 150 degree arc) for any magazine assignment so my reputation is not on the line. I am attempting to take the successes (few) and the failures (many) with a grain of salt. As it stands right now (there are still three more rolls that I have yet to process) I have only one panoramic of Monument Valley. The negative is marred with processing marks on the sky which could be the result of repeated cooling and warming up of the film from hot car to cool hotel refrigerator. Or it could be something else. There are two versions of the same negative. One is a more or less straight scan to which I have added a vignette border with Corel Paint Shop Pro X2. The other is my jury rigged method of instantly making a panoramic negative look like an antique. I place my negative on the scanner and the lay a sheet of white paper on top. I then scan the negative from the bottom as if it were a document. I reverse the resulting scan (to make the negative a positive) and the result shows the scratches and texture of the paper. I then add red and yellow to give it a sepia tone look. And that’s it. The other picture is a volcanic formation a few miles after Shiprock that seemed to have no name. It was odd to see it just there jutting out of nowhere. Link to: Monument Valley Aged A Few Minutes ago. Hosteen Joseph Joe remembered it like this. 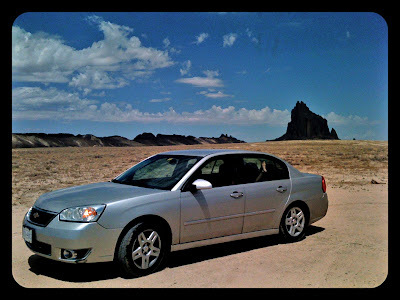 He’d noticed the green car just as he came out of the Shiprock Economy Wash-)-Mat. The red light of sundown reflected from its windshield. Above the line of yellow cottonwoods along the San Juan River the shape of Shiprock was blue-black and ragged against the glow. The car looked brand new and it was rolling slowly across the gravel, the driver leaning out the window just a little. The driver had yelled at Joseph Joe. Joseph Joe remembered that very clearly. The driver looked like a Navajo, but yelling at him like that was not a Navajo thing to do because Joseph Joe was eighty-one years old, and the people around Shiprock and up in the Chuska Mountains called him Hosteen, which means “old man” and is a term of great respect. Joseph Joe hat put his laundry sack into the back of his daughter’s pickup truck and walked over to the car. He noticed that its plates weren’t yellow, like New Mexico’s, or white, like Arizona’s. They were blue. “I don’t know him,” Joseph Joe said. He had said it in Navajo, because when he got close he saw he had been right. The man was a Navajo. But the driver just frowned at him. “You speak English?” the driver asked. “I don’t know Leroy Gorman.” Hosteen Joe said it in English this time. “I don’t now him,” Joseph Joe repeated. “I don’t live in this town. I live at my daughter’s place. Out there near the Shiprock.” Joseph Joe had gestured toward the Arizona border and the old volcano core outlined by the sunset. “Don’t live in here with all these people,” he explained. “I’ll bet you’ve seen him,” the driver said. He took out his billfold and fished a photograph out of it. “ This is him,” the driver said and handed the photograph to Hosteen Joe. Joseph Joe looked at it carefully as courtesy demanded. It was a Polaroid photograph, like the ones his granddaughter took. There was something written on the back of it, and an address. The front was a picture of a man standing by the door of a house trailer, which was partly shaded by a cottonwood tree. Hosteen Joe took off his glasses and wiped them off carefully on his sleeve, and looked a long time at the young man’s face. He didn’t recognize him, and that’s what he had said when he handed the driver his photograph. After that he didn’t remember the rest of it quite as clearly because just then it all began to happen. The driver was saying something to him about the trailer, maybe about Gorman living it in trying to sell it or something, and then there was a sound of a car braking on the highway, tires squealing a little, and the car backing up and whipping around and driving into the Wash-O-Mat parking lot. The car was new, too. A Ford sedan. Hosteen Joe had turned then and walked toward his daughter’s truck. Behind him he heard the sound of a car door opening. Then closing. A yell. The sharp clap of a pistol shot, and another, and another. When he turned he saw Plaid Coat on the gravel and the driver holding himself up by clinging to the door of his car. Then the driver got in and drove away. 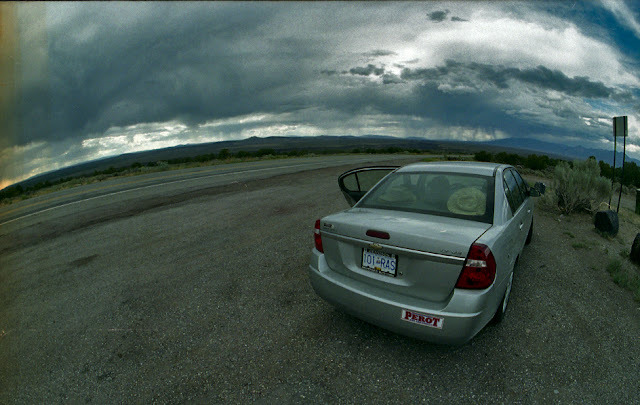 When the car got to the asphalt, it turned toward the river and toward the junction, which would either take it west toward Teec Nos Pos or south toward Gallup. People were running out of the Wash-O-Mat by then, yelling questions. But Hosteen Joe just looked at Plaid Coat, sprawled on his side on the gravel with a pistol on the ground beside him and blood running out of his mouth. Then he got into his daughter’s truck. The driver was a Navajo, but this was white man’s business. 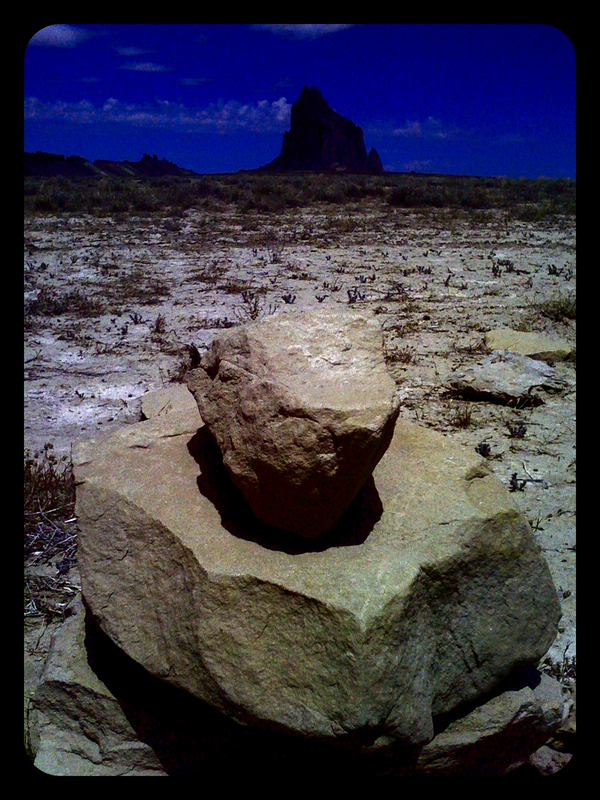 Shiprock Peak is the "neck", or remains of a solidified lava core, of a dormant 40 million year old volcanic pinnacle. It is shaped somewhat like a 19th century Clipper Ship with high trap-dykes running north from Utah and south from the main spire and rising about 1,800 feet above the four-corners New Mexican plain. It's elevation is 7,178 feet above sea level. It lies about 13 miles southwest of the town of Shiprock, New Mexico, and 6 miles west of Highway 66. It is also visible from Dzil Ná'oodilii (Mountain Around Which Traveling was Done), which is about 40 to 50 miles east of Shiprock peak. A long time ago the Diné were hard pressed by their enemies. One night their medicine men prayed for their deliverance, having their prayers heard by the Gods. They caused the ground to rise, lifting the Diné, and moved the ground like a great wave into the east away from their enemies. It settled where Shiprock Peak now stands. These Navajos then lived on the top of this new mountain, only coming down to plant their fields and to get water. For some time all went well. Then one day during a storm, and while the men were working in the fields, the trail up the rock was split off by lightning and only a sheer cliff was left. The women, children, and old men on the top slowly starved to death, leaving their bodies to settle there. Therefore, because of this legend, the Navajos do not want any one to climb Shiprock Peak for fear of stirring up the ch’iidii, or rob their corpses. Shiprock Peak has a number of other myths and ceremonies associated with it, these being the Bead Chant, the Naayéé’ee Ceremony, and the Enemy Side ceremony. The Naayéé’ee ceremony has a story of a large bird called, Tsénináhálééh (Picking Up Feathers), a bird that lived on top of Shiprock Peak and flew to Roof Butte (Dzil Dah Neeztínii - Where the Mountain Went Out on Top) to get men, never women. The bird went to Roof Butte every day. He is not at Shiprock Peak any more, but lives in the Sun’s house. He was the child of the Sun and Changing Women. There are also stories told of Shiprock Peak in the Enemy Side ceremony. Addendum: My friend and former book seller Robert Blackwood has often asserted that the mark of a good mystery thriller is one's desire to re-read it. 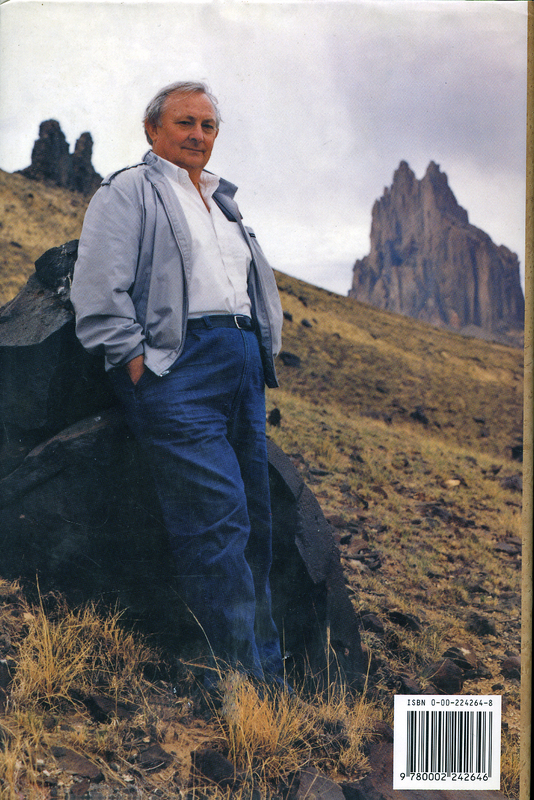 I have never re-read any of Tony Hillerman's Navajo police procedurals but now that the places in his books have a face, I know what my late summer reading project is! ﻿ I am certain that in not to far in the future people will wonder how anybody read anything before the advent of electronic books. These electronic books will no longer be called such in the same way that automobiles have not been horseless carriages for at least 110 years. The same will apply to digital cameras. After all while we still have film cameras we no longer ever differentiate them from wet plate or Daguerreotype cameras. The terms SLR (single lens reflex) a staple of photographic nomenclature since the late 50s until perhaps 12 years ago has been vanquished and replaced by DSLR or digital single lens reflex camera. The term reflex comes from the fact that the light that penetrates the lens is directed upwards, 90 degrees to a pentaprism that rights up the image so that when you look through the viewfinder you see exactly what you will get (although most cameras will thwart you to prevent that). There have been a couple of innovations that will make the hump of the pentaprism almost obsolete or at least you will not be listening to that mirror swing up (to allow the light to go in a straight line and hit the sensor). 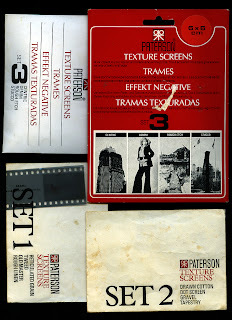 One is the semi transparent mirror that diverts part of the light upwards and the other part straight (the mirror is now stationary and this innovation was borrowed from the Canon Pellix of the mid 60s). The second is that the live view of digital point and shoots has been incorporated into the more expensive DSLRs so that the pentaprism viewfinder might go the way of Buick Dynaflow. Many an avid photographer must wonder what we photographers did before the advent of Photoshop. Our possibilities were indeed limited and some of our special effects like posterization were onerously difficult. American photographer Paul Outerbridge pioneered a colour system in the late 30s called color carbro. His color cabro prints (very time consuming and difficult) resulted in nudes where the skin tones looked like the real thing. No other colour process ever got close. Kodachrome enhanced the colour of skin, Ektachromes tended to add a bit of blue or cyan and by the late 70s Kodak, Agfa and other colour film companies were launching film that added a sun tan to make people in portraits look healthier! And now even an amateur photographer with a mid quality DSLR can take portraits and nudes in which intelligent use of custom white balance will result in skin as real as it is. Outerbridge would be dazzled. I have seen my students photograph red haired people and achieve in a few minutes pictures that for the first time (in my opinion) the sublety of red haired skin shines without diminishing the brilliant hair colour. Unfortunately these photographers rarely bother to calibrate their camera screens, their computer monitors and might even use cheap (and further uncalibrated) desktop inkjet printers. In 1976 I learned to print colour negatives in my home darkroom. Soon enough I was looking for special effects. 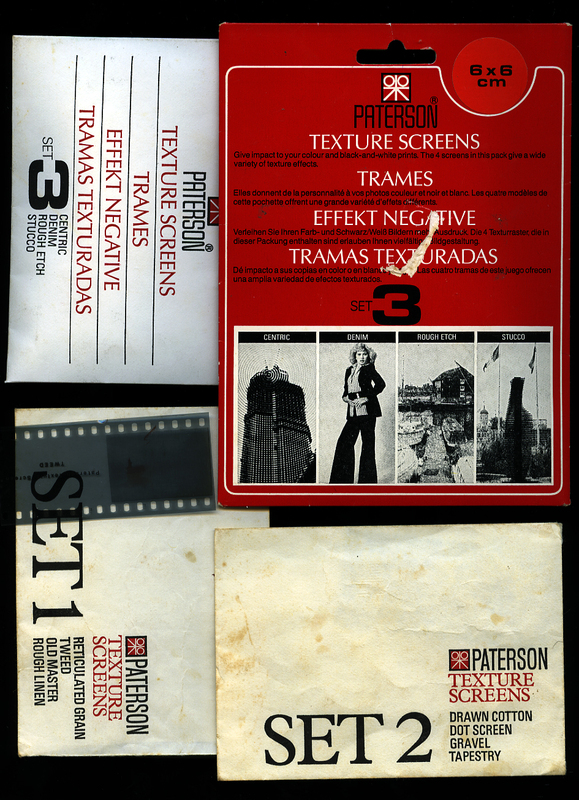 One of those came in a package manufactured by an English company called Paterson (they also made darkroom trays, thermometers, etc). These were texture negatives that could be sandwiched with negative (either in colour or b+w) and then printed for the effect you see here. 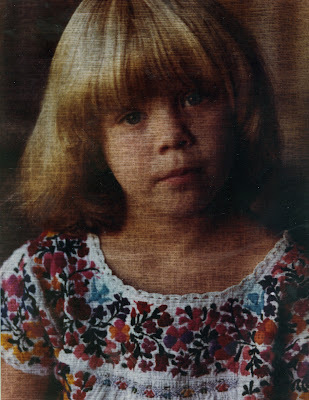 All the above came to mind when I sent my San Antonio classmate friend Lee Lytton a picture of Rebecca that was a greatly enlarged section of an already grainy and badly exposed colour negative. In the last couple of days I had been working on a blog dealing with his beautiful and instructional tour of his childhood haunt of La Parra Ranch and Sarita, Texas. The picture of Rebecca had taken in the ancillary chapel to La Parra, indeed the place that had been central to many of the religious activities of the ranch and even the place where Lytton’s father’s funeral had been held. His father’s grave is a few feet away. 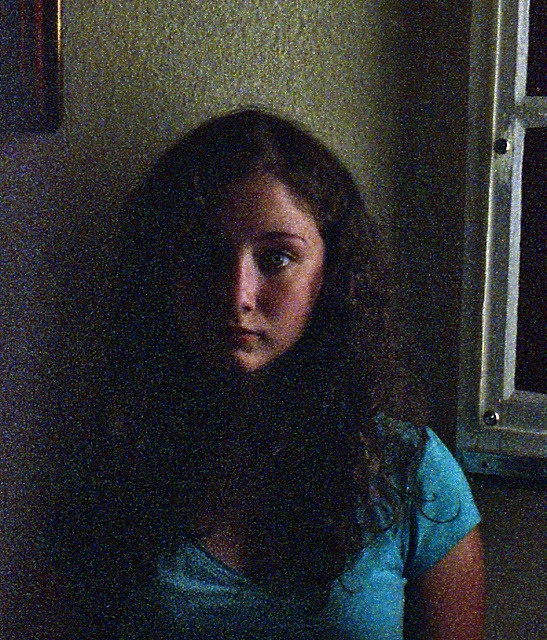 You really should put the underexposed photo of Rebecca in there. It is an accidental masterpiece. I see the resemblance, but believe me, the photo of Rebecca is one of a kind, and whether it is part of the story or not, it should be a treasured photo. There was no way I could justify inserting the picture in my blog on La Parra but thanks to Lytton I can tell the story of these three pictures and by writing a blog which is far easier and taking up less time than the one on A Ghost in La Parra, I can soon catch up and start writing true blogs of what is happening every day. And yet this blog with the date July 25 was inspired by the events of today (as I write this) August 3d so it must then be a real web log diary. 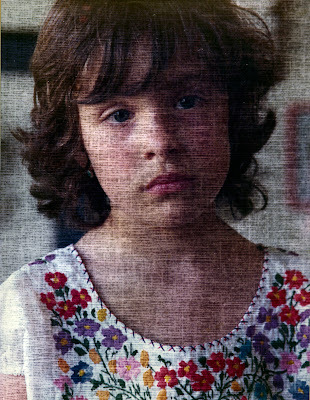 I must add that in spite of the fact that Rebecca's enlarged photograph involved using a very good Epson scanner the result, while far quicker, produced an image no different had I gone the route of printing the negative with my enlarger. One of the pleasures of not reading a daily paper (and it is one of my most treasured pleasures, nontheless) is to return home to find a 3 week pile of Vancouver Sun and NY Times on my den sofa. I started by removing from the pile the three Sunday editions of the NY Times and the three Saturday Vancouver Suns. That kept me busy for about two days as I read up on all I had missed. Most of my friends (former writers and journalists) are constantly telling me how they do not read the Vancouver Sun because it is a terrible paper. I mostly disagree with them as I like to read some of the Sun's excellent columnists and occasionally they have editorials that apply to life in Vancouver, BC and Canada that I would never find in my NY Times. Petrichor (pronounced /pɛtrɨkər/; from Greek petra "stone" + ichor the fluid that flows in the veins of the gods in Greek mythology) is the name of the scent of rain on dry earth. Who would have known that I would have been dazzled by a word that so aptly describes one of the singular pleasures of anybody who possesses a good olfactory sense (that’s me!). It is a word that I would hasten to observe must have a translation into the Navajo and any other culture that has to face continued droughts. While Argentine pampas are not especially famous for extreme drought I can still remember the smell of rain when it began to descend on a dry pampa in my summer stays in youth camps that my parents sent me to after the Christmas holidays. 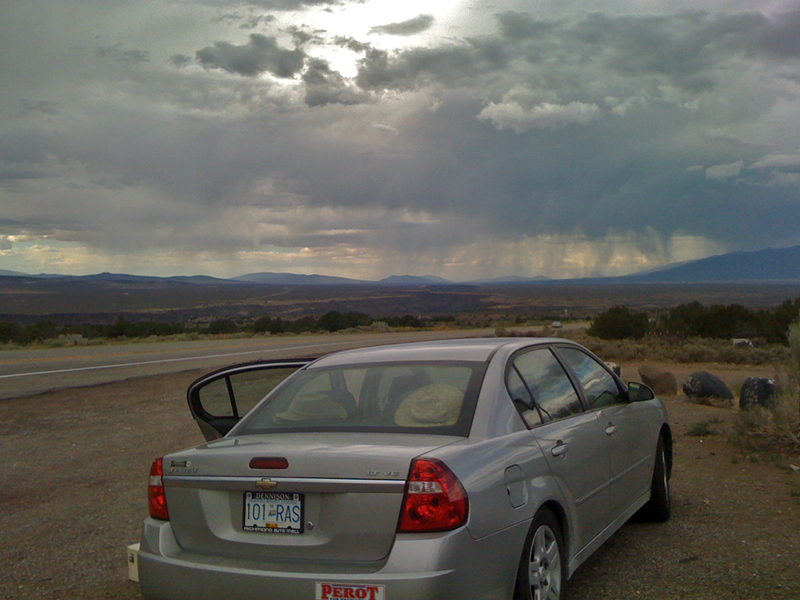 It is a smell I acutely was able to enjoy as we approached Gallup, New Mexico and rain began to fall intermittently and then quite heavily on our Malibu’s windshield. 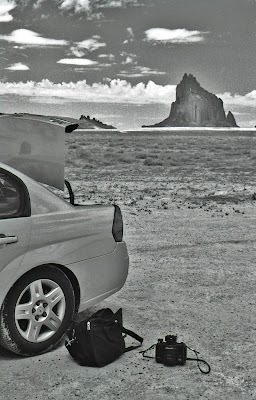 From the moment that I had the idea of driving to Texas I thought of Arizona and New Mexico and their intimate connection to the Navajo and the Hopi that Tony Hillerman had written in his novels featuring the Tribal Police Officer Jim Chee and detective Lieutenant Joe Leaphorn. When I had read every one of his novels I had been mesmerized by names of the town such as Gap, Gallup, Tuba City and Shiprock. I had imagined the wonder of rain about to fall on the Sangre de Cristo Mountains and enjoyed Hillerman’s descriptions of the mountains, the sound of the infrequent rain or the boom of the thunder that followed the frequent sheet lightning (but alas with no rain!). In fact when I got home I took out all my Hillerman novels to look for a quote where either Jim Chee or Joe Leaphorn go to Washington DC and are astounded by the action of windshield wipers during rain while staking out a suspect’s house. I have not been able to find the quote so I am no thinking that it must all reside in my imagination. 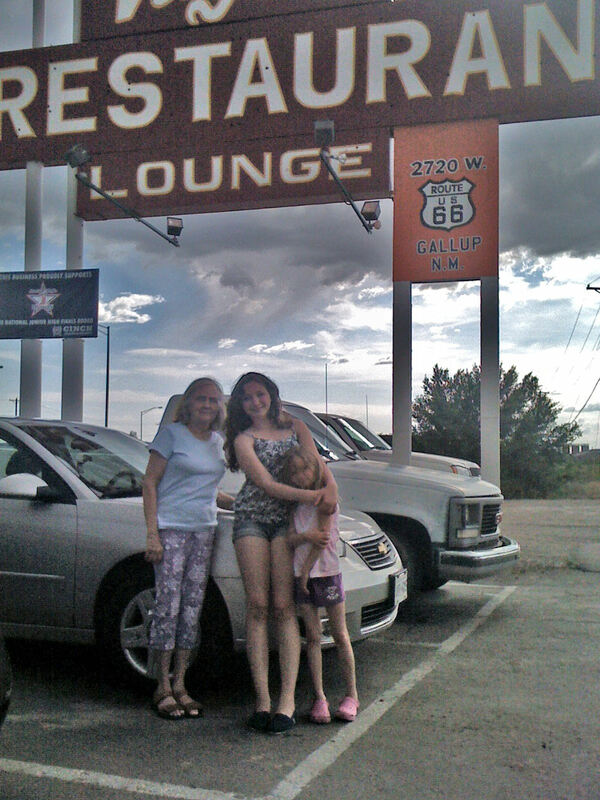 As we were approaching Gallup and the rain we asked Rebecca to choose a restaurant. 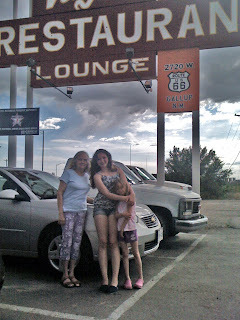 We also wanted her to select one that would be on the iconic Route 66 as this would please their father. The place chosen was Virgie’s Restaurant & Lounge. The rain had stopped when we arrived and the heat was stifling. When we entered the restaurant I saw quite a few patrons sitting at little rectangular tables but further in there an area with booths. We sat there. As I looked around I immediately noticed that this was not really a Mexican restaurant. I might serve Mexican faire but the staff and the patrons were definitely nothing but Navajos. Next to us there was an older woman with four young girls. I guessed she was the grandmother. Adjacent to them was another booth occupied by two men. One of them said nothing but the other was loquacious speaking in Navajo to the grandmother I assumed was his wife (and I was right, I was to later find out). The grandmother spoke, infrequently, to her girls in English. The girls were well behaved. The other man was as silent as can be. I was curious and I wanted to talk to them but I knew from my Hillerman novels that Navajos rarely talk except when they have to say something that is considered important. Finally I threw caution to the wind. I asked the grandmother if she was a Galluper or a Gallupian. The loquacious man, with a very straight face, answered for her, "No we are Navajos.” I the told the grandmother that my Rebecca was admiring the extremely black hair and braids of her granddaughters. She smiled and immediately the loquacious man, who now was smiling and most pleasant, asked me where we folks were from. The conversation immediately shifted from the frequent Vancouver rain to the fact that it had not rained in those parts since October. The man then told me that they were in town to watch a bull riding contest. They were from further down the road to Albuquerque, in a place called Church Rock near the town of Wingate. 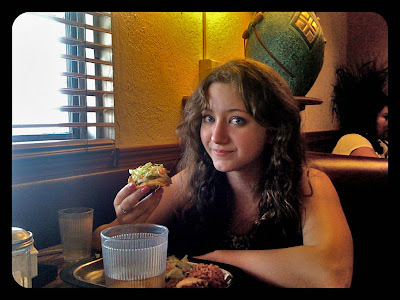 The food was Mexican but oddly and wonderfully different. We left with smiles in our faces after having such a pleasant conversation with the first Navajos we ever met. I'm still pretty new to Gallup, from Rhode Island. Just wanted to say hello and see if there are other Gallupers around?